LEDs aren’t new to the automotive industry. Over the last two decades, LED technology has made its way, albeit very, very slowly, into different areas of the car’s exterior including headlights, tail lights, emergency lights, etc., and for good reason. LEDs are brighter, more energy efficient, and much safer than incandescent alternatives. As LEDs become the new norm outside of vehicles, helping us avoid those dreaded fender benders, several automakers are beginning to see the value for car interiors, too. While the exterior is all about brand image, the interior is all about the ultimate purchasing factor: Brand experience. And lighting, in particular, has the extraordinary ability to pull the driver in physically and emotionally. At first, automakers put LEDs behind some indicator buttons and signals to enhance visibility, but as the technology becomes more cost-effective, manufacturers are placing them everywhere to create a unique aesthetic and ambiance. Some car manufacturers like Ford, BMW, and Audi have even gone as far as creating their own custom LED bulbs to match their distinct brand identities. Multimedia systems and displays that require wide-area illumination to deliver navigation information, entertainment, indicator signals, etc. While the possibilities for LED lighting within automotive interiors are endless and exciting, implementation requires a thoughtful process. 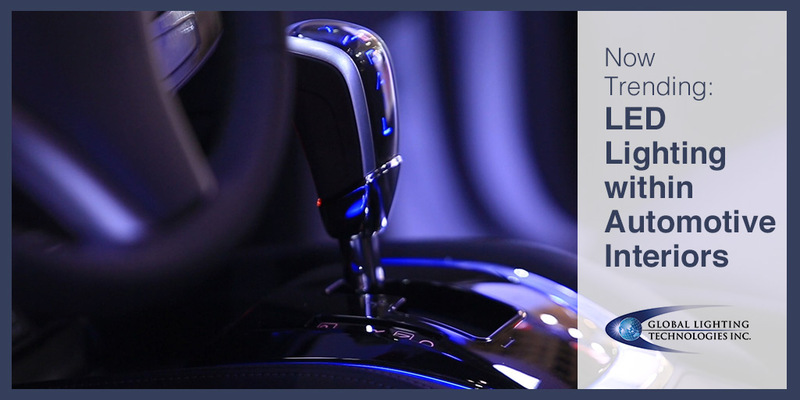 Given the interconnectivity of interior vehicles’ computer and lighting systems, our designers need to collect some important information so we can develop a light guide solution that integrates seamlessly with the application and rest of the vehicle. What real estate do we have to work with? What are the size limitations? What are the requirements as far as performance, color, target brightness, uniformity, temperature, etc.? What types of performance testing (reliability, thermal, etc.) are required? There’s no denying that LED lighting within automotive interiors is here to stay. Not only are they energy efficient, but they enhance appearance, quality, and comfort. In other words, they help us enjoy the ride. At GLT, we have the unique opportunity to support the innovations, like LED lighting, that drive the automotive industry forward. As a result, we’re constantly working to develop thinner, brighter light guides that create a better and brighter experience for drivers. If you have a custom lighting need or would like to speak with one of our automotive representatives, please contact us today.